I hope you all enjoyed a safe and happy new year celebrations. Personally I was asleep before midnight (any other night I'm still awake at 2am). A new year means one thing - yearly favourites! Some of the products mentioned are newly discovered in 2015, some are old favourites. I just looked into my makeup drawers and pulled out the products that stood out to me, ones that I have used a lot over the year and rely on or the new products that have crept into my heart. Makeup wise this year I was pretty laid back. Honestly at times makeup was the least important thing but other times it was what helped me get it together and able to face the day. My base and my lip products were definitely the most used parts of my stash in 2015. I use this as a moisturiser/primer under foundation, I find it really hydrates my skin and leaves it glowing. A perfect base for your makeup. TIP: the mini tubes actually work out cheaper than the full size bottle! I love this concealer for my under eye area. The formula is hydrating and doesn't crease. The colour match is great and a little goes a long way. Pricey but worth it. My 'ride or die' foundation. Perfect formula and shade. It is a true, everlasting love. I have had this product since December 2011 but it is really only been this year that I have truly appreciated it. 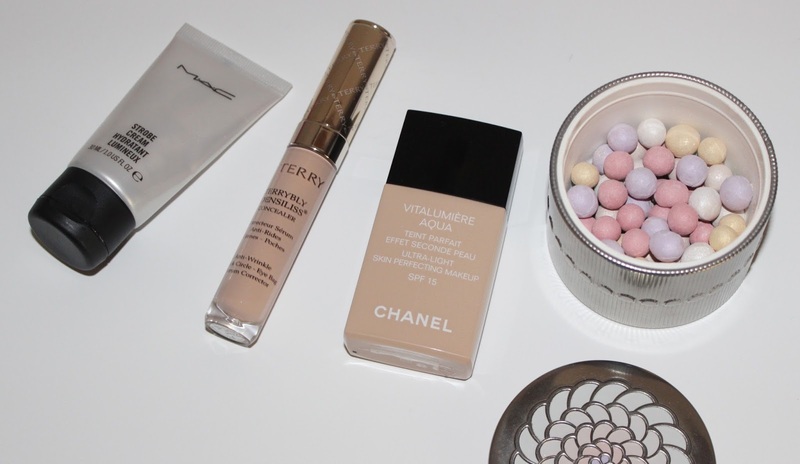 This powder really does give the most perfect finish to my skin. It sets my foundation leaving it looking glowing and radiant. I love! This palette got a good workout from me this year. I spent a lot of weekends away from home and I almost always packed this. It has two different satin pink shades and one shimmery pink shade. The shades are pigmented and wear well. Sadly this was a limited edition product. 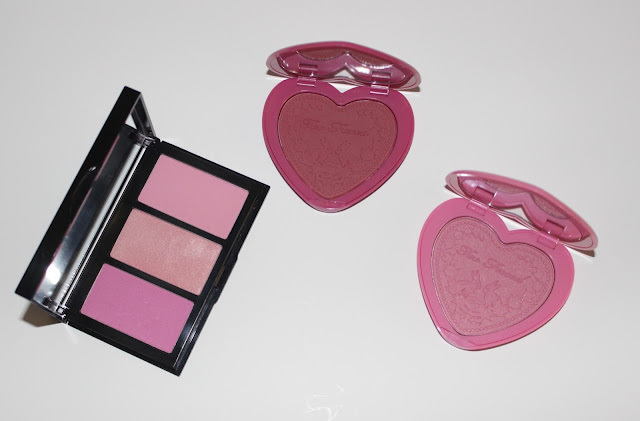 These blushes are too cute to not love! I have the shades 'Your Love Is King' and 'Justify My Love'. Both shades have strong pigmentation (a very light hand is needed) and last all day on my cheeks. I reach for these often and hope to add more shades to my collection in 2016. This is a product I have been using on and off since its release a couple of years ago but this year I really started to appreciate it. It is perfect for when you want to do your brows quickly and without much hassle. I have been a Chanel lover for years but this was the first time I had tried these eyeliners. It was love at first swatch! 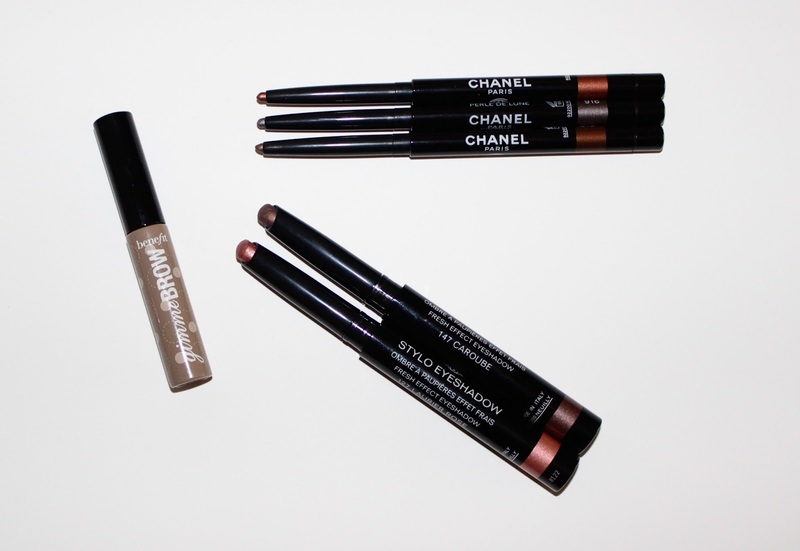 They are easy to apply, last all day and perfect for that smudged out eyeliner look (that I love). The shades I have are 918 Ardent, 916 Perle de Lune and 919 Erable, they are all more metallic shades that are lovely with my brown eyes. This formula was originally released a couple of years ago but this year Chanel released new shades and I fell hard in love with two of them. These shadows are great as a one colour all over the lid look. Apply and blend the edges and you are done - they don't budge until you remove them. 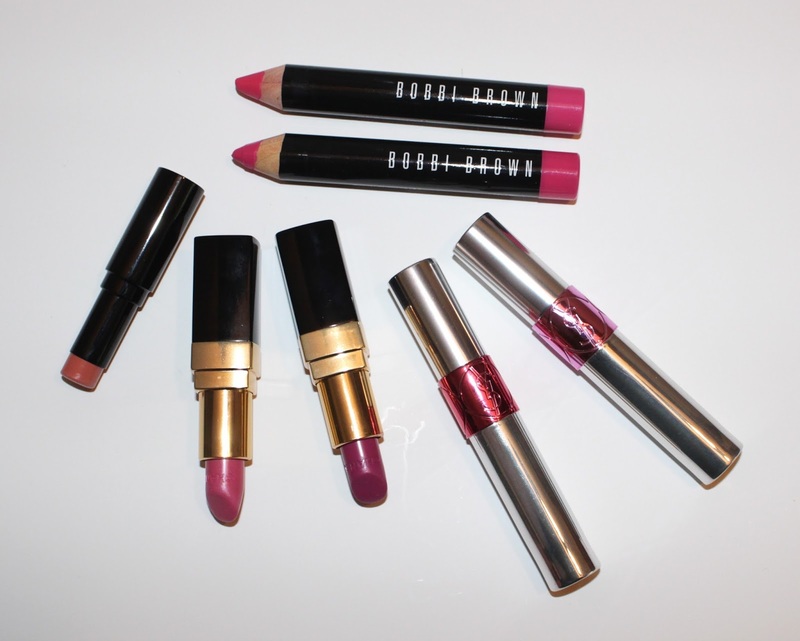 The shades I have are 147 Caroube - a cool toned, taupe brown and 127 - Laurier Rose - a rose gold. I really didn't expect to love these as much as I do. They are matte lip colours but they are still comfortable to wear, do not dry out my lips and the crayon shade makes them easy to apply. One of my most reached for lip products for the year. I have the shades Hot Berry and Hot Pink (which I think were limited edition shades (sorry!)). My favourite product when I want just a hint of colour on my lips whilst still hydrating them. It is essentially a tinted lip balm, an expensive tinted lip balm but I am really enjoying it. It is just such an easy and fuss free product. Chanel reformulated the Rouge Coco formula this year and I found it a real improvement on the previous version. The formula is now very creamy and smooth and the shade selection is much better. I have the shades 448 Elise - a cool rose pink and 454 Jean - a cool berry/purple pink. I found the formula very moisturising and comfortable to wear, the wear time is on the shorter side though. Another product I was surprised to like as much as I do. These apply like an oil and then the colour develops/deepens on the lips. These are super moisturising and make my lips look plump and healthy. I love the stain they leave behind once the oil has been absorbed or worn away. A favourite for when my lips are feeling dry. I have the shades No. 5 and No. 8. Well, there is my 2015 Favourites and my first blog post in far too long. Life just got in the way, again. 2015 has been a hell of a year for myself and my family. Here's hoping 2016 will treat us all better! 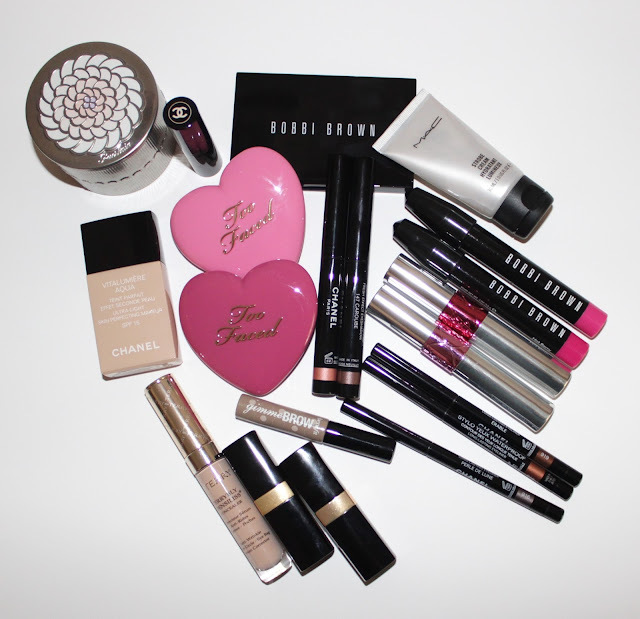 What were your favourite products for 2015? Great picks! The By Terry concealer sounds great!